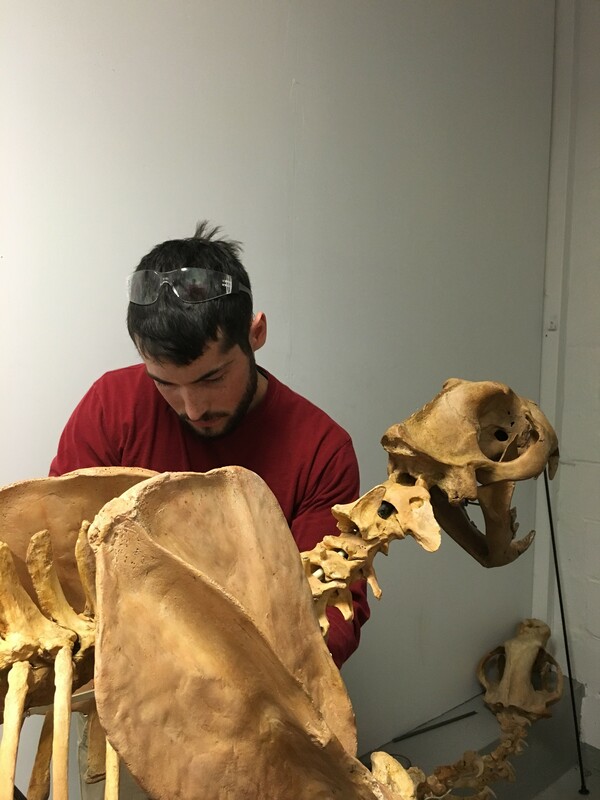 In a small, well-lit space deep inside Burlington's Soda Plant, artist Kyle Sikora settles the skull of an extinct female North American lion onto a blue, padded frame. The Conant Metal & Light employee disappears behind the massive skeleton, more than nine feet long, as he crouches down to adjust its 17-inch noggin. Alan Stout of Rome, Georgia, owner of the skeleton, keeps a vigilant watch from the room's entrance as he simultaneously entertains this reporter. A retired food-safety official,Stout now operates an online business called Dinoland Plus. It offers "museum-quality reptile and mammal pieces for sale, fossil preparation [and] knowledge of animals in all time periods." But this lion reconstruction won't be for sale. At least, not for a while. Scott Terry, a painter and sculptural technician who lives in Charlotte, hunches over next to Sikora, supervising the careful manipulation of wire and bone. As soon as the young, dark-haired artist emerges from behind the skeleton, Stout makes a beeline toward him — and the head. "Is that going to stay on?" the collector asks. Terry responds in the affirmative, giving the skeleton a little wiggle. It bends with surprising pliancy, a credit to the careful wiring and supports that Sikora has created. He has dedicated 240 hours to the project since August. Stout's eagerness is warranted. He's been collecting the requisite bones for this particular skeleton for the past eight years. Now completed, it will become a part of his private collection. 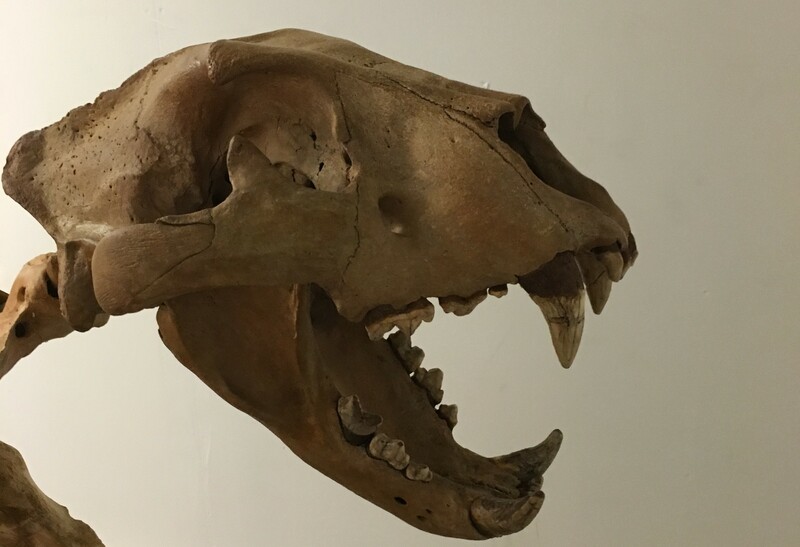 He estimates that the lion is one of fewer than 10 complete reconstructions in the country, five of which are housed at the La Brea Tar Pits & Museum in Los Angeles. "They are just so rare," Stout says. Panthera atrox, or "cruel cat," appeared and disappeared in the Pleistocene era. According to the San Diego Zoo website, it was 25 percent larger than the modern African lion, and the skeleton makes that clear; positioned in an aggressive attack position, it is massive. This particular female has been pieced together from four semi-articulate sets of remains. Its skull was found in a gold mine in Alaska, Stout says. So, how did a young artist from Vermont hook up with a Georgia bone collector? Through Terry, who has prepared remains for Stout in the past. He is a preparer of sorts; he fills in chips in fossilized bones and models them so they don't look like they've been in the ground for centuries. He often employs Conant to create mounts for the finished pieces. "Kyle has been showing mechanical aptitude," says Steve Conant, "so we gave him a shot to do this one. He doesn’t emote a lot, but we could tell when he launched into it that it was something that really hooked him. He revealed later to our operations manager that this was something he’s always wanted to do." On his own time, Sikora makes complex, often-macabre masks. In September for the South End Art Hop, he exhibited a sculpture of a dinosaur with glowing eyes and moving legs. "I've been working with Scott on and off since last fall," says Sikora. "I started out with making stands for skulls and made my first full body stand for a small raptor earlier this year." 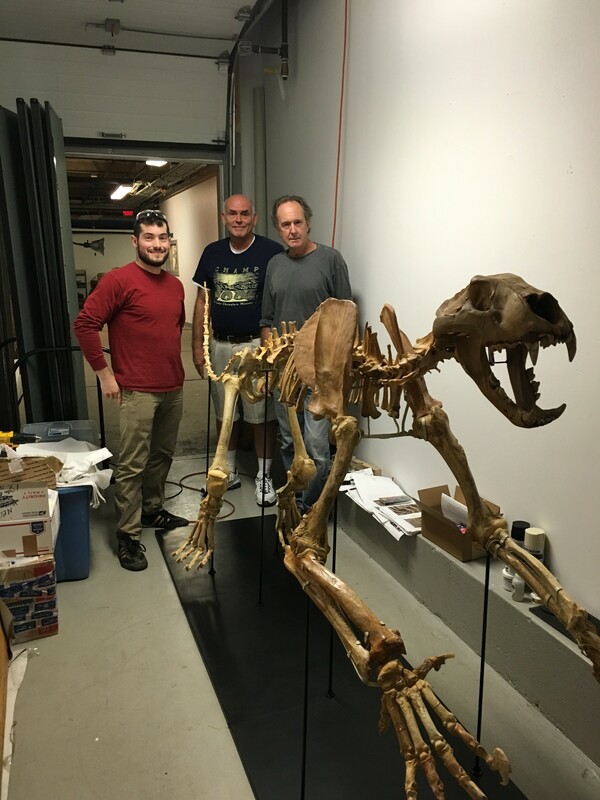 "Working on the lion skeleton has been an incredible challenge in many ways," Sikora says later via email, "but I am very grateful to have had this opportunity. I have always enjoyed working with animal forms in my personal work, so it helped to put me in a similar mindset when working on this project. "I often try to create artwork that can come to life through a performer or some sort of kinetic force," Sikora adds, "so it was fascinating working with something that once existed as its own living being." Conant notes, "As an employer, the most fun for me is when the business creates opportunities for staff to grow substantially. Not only did we learn [Kyle] was interested in this field, but we were able to plop an extraordinary project in front of him that typically would be placed in front of a seasoned museum professional. "It was exciting to see him step up to the plate, give it his all and come out on the other side with an amazing piece to add to his portfolio," Conant says. While Sikora has found a new passion, Stout has found a new companion. He has a special room set up for her in his Georgia home. "I have one chair in there," Stout says, "and I'm going to look at [the skeleton] every night before I go to sleep."